This shield features a classic uppercase Lambda symbol across the front. The design is historically accurate and similar to ones actually used. The Wooden Greek Lambda Shield represents the 11th Letter of the Greek Alphabet and has a value of 30 in the system of Greek numerals. It is also a symbol associated with physics and the radioactive decay constant. The lowercase lambda, in particular, also happens to be the dominant symbol of the popular Half-Life games. 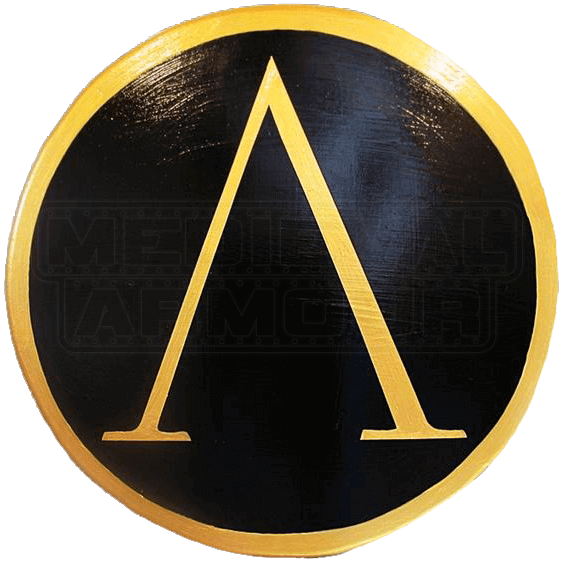 The Gold Greek Lambda Shield is made out of a 0.5 inch thick smooth composite wood, which is considerably stronger than plywood. Dual leather straps are used to secure the arm along the back one going over the forearm and one intended to be gripped or held. The Wooden Gold Greek Lambda Shield has been applied with several coats of varnish to further protect and preserve it from wear. The Wooden Gold Greek Lambda Shield measures about 25 inches in diameter. This wooden shield would be perfect for that upcoming Renaissance Festival in your area, or maybe some backyard brawling between friends. The Wooden Gold Greek Lambda Shield would be perfect for upcoming Renaissance fairs, theatrical productions, or medieval reenactments. This wooden shield would also make a great gift for that Renaissance enthusiast for someone you know.